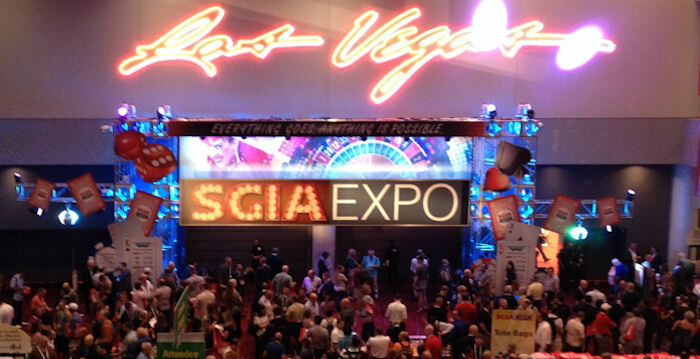 The Top Value Fabrics team enjoyed yet another terrific trade show with old friends and new, this time at the SGIA Expo in Las Vegas. We love to help our customers find the best solutions for their needs and we're proud to offer a complete line of superior print media from Frontlit and Backlit to Blockout, PET, Mesh, Polypropylene and three lines of Specialty Textiles. We also debuted a new booth this year across from Mimaki in the center of the action on the show floor. Our Impress With Pure Performance theme was inspired by our customers, who impress with beautiful prints on our media every day. Our show partners for the hardware were REXframe who provided our awesome, easy, reusable textile frame system for the booth and Orbus for our terrific, sleek graphics display hardware. There were numerous demos across the show floor with industry partners who chose TVF Media, and we were also proud to partner with SGIA and Shepard as they chose our material for their gorgeous show entrance. Check out more highlights through the link below and call us toll free today to learn more about our media or to request samples at 855.618.4500.